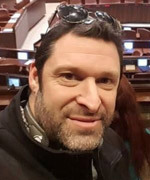 September 16, 2018 - Ari Fuld, 45, father of four, was stabbed to death by a Palestinian terrorist at the Arim Mall at the Gush Etzion junction. Ari Fuld, 45, a resident of the West Bank settlement of Efrat, was stabbed to death on Sunday, 16 September 2018 by a Palestinian teenager outside the Arim Mall at the Gush Etzion junction. Despite his wounds, Fuld chased and shot at his attacker before collapsing to the ground. He was rushed to Jerusalem’s Shaare Zedek Medical Center with multiple wounds, but was pronounced dead. Fuld was laid to rest at the Kfar Etzion cemetery late Sunday night. His funeral was attended by thousands, including a number of government ministers and politicians. Born in the US, he immigrated to Israel in 1994. He is survived by his wife Miriam, and four children: Tamar, 22, Naomi, 21, Yakir, 17, and Natan 12.